David Maranha’s recordings stretch back over 20 years with the Portuguese avant trio Osso Exótico, as well as collaborations with Z’ev and Minit. 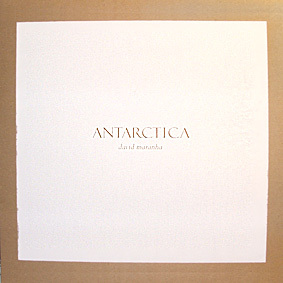 A followup to Marches Of The New World (2007), Antarctica is made up of two side-long excursions into monolithic drone-rock. In the vein of Tony Conrad & Faust, “Venus In Furs,” La Monte Young and Terry Riley, Maranha’s ensemble is driven by keyboards, strings, and hypnotized-heartbeat percussion. Like the great white expanse of the titular continent, it can be taken in simply as a glorious wash of sound; listen to it closely, however, and you’ll hear the smallest details jump out in high relief: a feather can move a mountain. An edition of 300 copies in silkscreened covers. Digital download coupon included.